The Ghiradelli Chocolate Company, based out of San Francisco, has a lesser known manufactory across the bay in a small suburb called San Leandro. 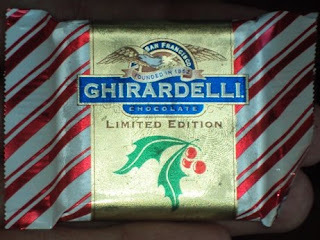 My grandmother, who lives in San Leandro, is well-connected to the factory and continues to get bulk amounts of gourmet chocolate—Ghiradelli is fancy schmancy—for free or for next to nothing, I’ve never been exactly clear on that. In any case, while I enjoy a good dessert, I’ve never been big on sweets or candy. Skittles and Reese’s Peanut Butter Cups and Starburst are great, but I never cared that much… until I came here. I’m not sure what it is about being here that makes sugary sweets taste so much better. It might be the heat of the sun, the barrenness of the lifestyle, the rarity of dessert. I also feel like we’re far enough away from The States, it’s rare that we get good ol’ American processed food, and any time we fall back into the synthetically flavored food stuff that’s been chemically engineered in New Jersey, it’s like a junkie in withdrawal finally getting his fix. My first taste of this glory was during training in the village. Jordan received some gummy bears in a package from his family in The States, and he shared them. Showing a fool’s restraint, I only took one bear, but instantly after I popped the thing in my mouth, my brain exploded. It was like singing. It was like a mouthful of smiles. It was like a bundle of gummy warmth. I’ve always liked gummy things, but this was a new level. As packages started to come more frequently, someone would pass around a bag of Skittles or bite-sized snickers, and the euphoria would come right back. Once we were out of training, I would occasionally buy little pouches of Peanut M&Ms, which I’d never appreciated in The States, but which I’ve realized are a joyous little confectionary. My grandmother sent an envelope of Ghiradelli Chocolate. Normally I would have set this aside and offered it to guests or perhaps re-gifted it. Here, my brain was so excited about it, I had to hide it and ration it to ensure it lasted. And just as it began to dwindle, my parents came to visit, bringing with them a 6-pound box of Ghiradelli chocolate! Wowa. I had to find a special container to fit this seemingly bottomless beast in my freezer. As word of this got around, I would have people over, and occasionally catch them staring into my freezer, as though hypnotized. “You can have some,” I’d say nonchalantly, feeling a little God-like. When a pair of year 9s swept my classroom, I gave them 3 chocolates each. 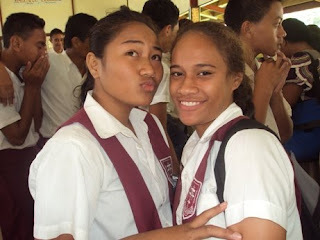 When Site and Filifili came by my house the night they pulled an all-nighter, I offered them chocolate. They’ve gone over quite well with students; I should try it more often. It’s a holiday set, so it has some unusual flavors like Peppermint Bark and Pecan Pie. I’ve decided to save the Eggnog for last since I find them surprisingly delicious and there’s no eggnog in Samoa and the flavor feels out of season in August—a culinary “Jingle Bells”. They key is the moderation. The more you have, the less special it is. Whatever. This post has made me hungry. I’m going to go binge. I hope you’re well. Who knew “eggnog” was one word? Pictures below. 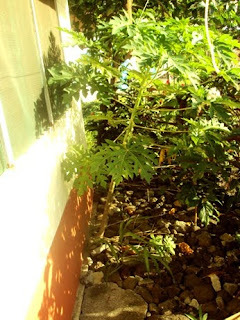 This papaya tree is growing out from underneath my house. Girls making goofy faces a the science faire. 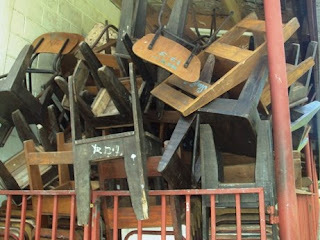 After the science faire ended, the boys "stacked" chairs. This would not have gone over well at my reception job back in high school. Avo just called & asked if you wanted some chocolate. Isn't it ironic? It's like 10,000 spoons when all you need is a knife. i want gummy bears now. this world is too small. I've been reading all the blog entries I missed and came across this one, with a photograph of my Grandma's next door neighbour, Jessie.small world indeed.